I had a meeting I couldn't miss at work until 4 today, so got a very late start. Too late, as it turns out. The cluster of storms that had earlier produced an F4 tornado and hail upwards of 4 inches in diameter was still going strong near Bloomington, IL a little after 4, so I decided to blast north and try to intercept. It looked good until I was within about 20 minutes of it - at which time it weakened and sped off to the SE. Since I didn't have radar, I had no way to know it had evolved into a bow echo and the strongest part of the storm had shifted off even farther to the SE than the storms I could see, which had obviously become multicellular. The upshot is that all I got today was a rainbow and some impressive cloud formations, and 300 miles of driving. Oh well, that's part of chasing. Even so, it's important to always remember that storms don't have to be severe to be photogenic. The rainbow, visible only in a sunlit precipitation shaft, made quite a nice picture. 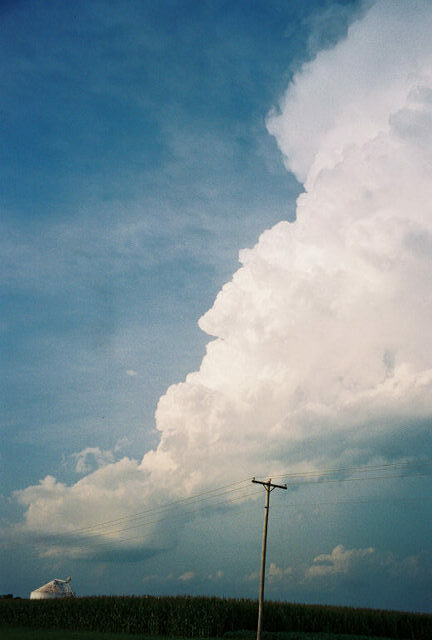 Also making a nice picture was this small cumulonimbus getting sheared apart by the strong upper winds. It looked like it wanted to be a LP supercell, but all it could do was get blown apart. 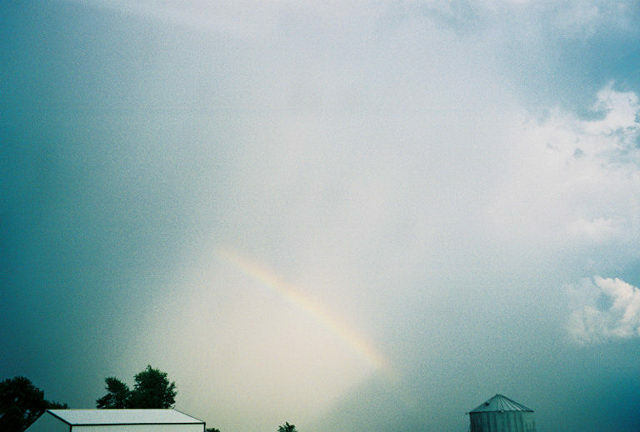 This is the same cell that earlier produced the rainbow in the other picture.